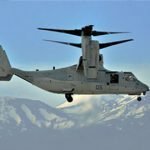 The Defense Logistics Agency has awarded Textron’s (NYSE: TXT) Bell subsidiary a pair of delivery orders worth up to $96.7M to provide right and left hand aircraft assembly parts for the proprotor gearboxes of the U.S. Navy’s V-22 Osprey fleet. Each order is valued at $48.4M and work will take place in Texas through April 21, 2024, the Defense Department said Friday. The service branch will use its working capital funds for fiscal 2018 through fiscal 2024 on both orders. V-22 is a joint service multirole aircraft produced by Boeing (NYSE: BA) and designed to incorporate a helicopter’s vertical performance along with a fixed-wing platform’s speed and range.